If The Commitments, Bring It On and Drumline were all thrown into a mosh pit, pulled apart, swept into a dustbin, then spliced back together as one movie, the end result would no doubt be something like The Fighting Temptations. Even though it’s a sloppy rehash of what’s been done much better elsewhere, Beyoncè Knowles comes out a winner and the movie has a good spirit, although its soul is artificial. 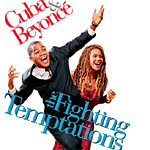 The Fighting Temptations tells the unlikely tale of Darrin Hill (Cuba Gooding, Jr., Jerry Maguire), a well-meaning, ambitious and bright-eyed account executive for a Manhattan advertising agency. Problem is, he’s a perpetual liar and his trail of fraud and credit card debt is finally catching up to him. Through a twist of fate, Darrin’s last gasp chance at redemption drops into his lap upon the death of his Aunt Sally. It’s her dying wish that he returns to Montecarlo, Georgia, and leads the Beulah Baptist Church choir to first place in the Gospel Explosion competition. In return, he would receive Aunt Sally’s stocks, valued at roughly $150,000. Having never led a choir before, he’s a natural for the job and is quick to sell himself as a record producer to the unsuspecting church members in order to gain their trust and fend off the ever-present opposition of Paulina Pritchett (La Tanya Richardson, Fried Green Tomatoes), the self-righteous sister of Reverend Lewis (Wendell Pierce, Bulworth). At Aunt Sally’s funeral, Darrin is blown away by the awesome talent the church choir possesses. He considers it a lock that he will get Aunt Sally’s shares and dig his way out of debt. Unfortunately, that choir was from another church and sang at the funeral in honor of the lead singer’s friendship with Aunt Sally. That “friend” is the real-life Rev. Shirley Caesar and she can belt out gospel tunes with a boatload of soul. Darrin has his work cut out for him as he collects a motley crew of no-talent locals and gifted convicts and tries to steer them into competitive shape. Holding out on the choir is the town’s shining star, Lilly (Beyoncè Knowles, Goldmember), a girl Darrin had a crush on as a child and who now sings “the devil’s music” in a local dive. The movie’s saving grace is Knowles; she’s a pleasure to watch and listen to as she steams up the screen with a smokin’ rendition of Fever, but even she was more dynamic when she had better material to work with opposite Austin Powers. The Fighting Temptations is a movie riddled with problems, including some incredibly sloppy storytelling, photography and acting from the supporting cast. This surprisingly amateurish, albeit enjoyable, production was directed by Jonathan Lynn, who was much sharper with The Whole Nine Yards and My Cousin Vinny. The screenplay was written by Elizabeth Hunter and Saladin K. Patterson, both with only limited TV credits prior to this film, and it often shows that their small-screen experience writing in 22- or 42-minute chunks isn’t quite enough to flesh out a story for the big screen. The story struggles to stay focused as it tries to be in turns comedic, romantic and musical. The comedy is often stale and the romance is preposterous, but the music is good. Very good. When Lilly’s son visits the barber for a haircut and a barbershop trio (‘70s soul group The O’Jays) performs an impromptu concert for the lad, complete with an electric shaver on backup, the movie shows where its spirit wants to be. That same spirit is on display when gospel, Christian rap, R&B and hip-hop singers such as The Blind Boys of Alabama, T-Bone, Montell Jordan, and Zane get a chance to take center stage. Unfortunately, much of the film’s two hours has a TV situation comedy feel to it (something along the lines of Amen with Sherman Hemsley). Too much time is spent on the one-note characters and shallow relationships instead of focusing on the music. In a display of the writers’ inability to pull situations together with some degree of plausibility, at one point Lilly turns down Darrin’s plea to join the choir only to show up at church in the very next scene. The moment feels empty, as if it was done simply to speed up the film’s plodding pacing and cut to the chase. There’s also no tension in the buildup to the final competition because the setup has made it clear from the outset that the movie wants to be an uplifting and happy-go-lucky experience. While The Fighting Temptations never quite succeeds in getting airborne, Knowles and the music manage to lift the film to the most modest of recommendations.